The Power Mac 7200 was the entry level second-generation Power Mac, part of the first group of Macs to use the PCI bus instead of older, slower NuBus. Originally produced in 75 MHz and 90 MHz versions (a.k.a. 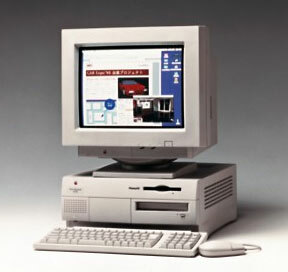 Power Mac 7215/90), the slower model was phased out when the 120 MHz model was introduced in March 1996. Apple introduced a brand new case design with the 7200 and 7500, one with a slide-off cover, an extra internal drive bay (compared to its predecessor, the Power Mac 7100), and a flip-up drive/power supply assembly, providing easy access to the motherboard. Performance can be significantly improved by adding a level 2 cache and upgrading VRAM to 2 or 4 MB. Unlike the simultaneously introduced 7500, 8500, and 9500, the 7200 uses a 64-bit memory and cache bus, one reason for its slower performance. Overall, the 7200 is a pretty good computer, but we call it a Compromised Mac due to poor implementation of the promised upgrade path. It wasn’t until late 2000 that Sonnet managed to create an accelerator for this computer. Low End Mac’s Compleat Guide to Mac OS 9, Charles W Moore, Miscellaneous Ramblings, 2008.05.12. Declared dead by Steve Jobs 6 years ago, Mac OS 9 remains fast and stable, but Classic software hasn’t kept up with Web changes. What Macs support OS 9, where to buy it, and how to update to version 9.2.2. Making the Crescendo/7200 more attractive, James Kachel, My Turn, 09.24. Dear How Sonnet could make the Crescendo/7200 a more attractive upgrade. Apple considers this computer vintage as of July 16, 2001 in the United States and July 23, 2001 in Canada. As of that date, service parts will only be available for units purchased in California and being serviced within California.